President Obama to Deliver Foreign Policy and Iran Speech at AU | American University Washington D.C. In his speech at AU, President Obama will focus on the recent nuclear agreement with Iran. President Barack Obama will give a foreign policy address with a particular focus on the Iran Deal at American University's School of International Service on Wednesday, August 5. The White House chose American University, because it is where John F. Kennedy made his famous 1963 speech on nuclear disarmament and world peace. President Obama's Iran Deal speech at AU falls on the 52nd anniversary of the signing of the Limited Nuclear Test Ban Treaty--a treaty prefaced by Kennedy's speech at AU. The treaty was signed on August 5, 1963, in Moscow by the United States, the United Kingdom, and the Soviet Union. The speech will be streamed live on the White House website, and archival video of the speech will be provided on American University’s website. Follow on Twitter at @AmericanU and @WhiteHouse, and join us on Facebook. 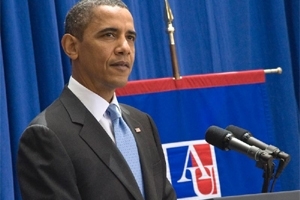 Obama has made several appearances at American University in recent years. During the 2008 presidential campaign, Kennedy family members, including the late Sen. Edward Kennedy, D-Mass. and current U.S. Ambassador to Japan Caroline Kennedy, endorsed Obama for president at a rally in Bender Arena. In July 2010, President Obama gave a major immigration speech at SIS, calling for a system that "reflects our values as a nation of laws and a nation of immigrants." In December 2013, Obama did a wide-ranging interview on MSNBC's political show Hardball with Chris Matthews. In front of a packed crowd of AU students at the Greenberg Theatre, Obama offered his thoughts on health care, the NSA wiretapping controversy, Pope Francis, and high-stakes battles with House Republicans. In 1914, when American University opened, President Woodrow Wilson gave the dedication. In 1934, President Franklin Roosevelt appeared at the launch of AU's program to help train federal employees in new methods of public administration. Today, AU's School of Public Affairs offers undergraduate, graduate, and executive-level programs to help build careers in public service. In 1957, President Dwight Eisenhower broke ground at the establishment of the School of International Service. In 1963, President John F. Kennedy delivered a historic foreign policy speech at AU's commencement. He called for a nuclear test-ban treaty and mutual understanding with the Soviet Union. In 1993, President Bill Clinton addressed AU's Centennial Convocation and focused on how the U.S. must exert leadership in the global economy. Clinton returned to AU in 1997 and encouraged equity in accessing higher education. After leaving office, Clinton appeared at AU in 2012 to accept the school's inaugural Wonk of the Year award. And former President Jimmy Carter launched the bipartisan Commission on Federal Election Reform at AU. The nuclear agreement with Iran is of special relevance next week. Thursday, August 6 is the 70th anniversary of the Hiroshima bombing; the AU Museum at the Katzen Arts Center is holding a Hiroshima-Nagasaki Atomic Bomb Exhibition through August 16.